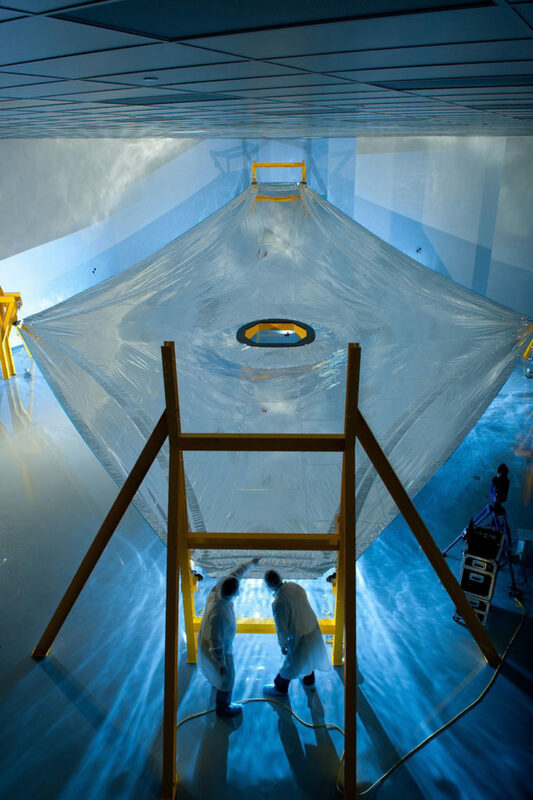 June 23, 2016 – The shiny silver material of the five-layer sunshield that will fly aboard NASA’s James Webb Space Telescope is a complex and innovative feat of material science and engineering. Each layer is made from a unique composite material, each has a specific thickness and size, and they must be precisely separated in space. There are even special seams and reinforcements to limit meteorite damage. NASA and its industry partners developed a lightweight, robust way to protect the telescope and mirrors from the sun’s infrared radiation in the material that makes up the sunshield. Some of the things that make the sunshield unique are its strong yet ultra-thin material, special kite-like shape, and the special role of its layers. The sunshield consists of five layers of a material called Kapton. Each layer is coated with aluminum, while the sun-facing side of the two hottest layers (designated Layer 1 and Layer 2) also have a “doped-silicon” (or treated silicon) coating to reflect the sun’s heat back into space. The sunshield is a critical part of the Webb telescope because the infrared cameras and instruments aboard must be kept very cold and out of the sun’s heat and light to function properly. Kapton is a polyimide film that was developed by DuPont in the late 1960s. It has high heat-resistance and remains stable across a wide range of temperatures from minus 269 to plus 400 Celsius (minus 452 to plus 752 degrees Fahrenheit). It does not melt or burn at the highest of these temperatures. On Earth, Kapton polyimide film can be used in a variety of electrical and electronic insulation applications. The sunshield layers are also coated with aluminum and doped-silicon for their optical properties and longevity in the space environment. Doping is a process where a small amount of another material is mixed in during the silicon coating process so that the coating is electrically conductive. The coating needs to be electrically conductive so that the membranes can be electrically grounded to the rest of JWST and will not build up a static electric charge across their surface. Silicon has a high emissivity, which means it emits the most heat and light and acts to block the sun’s heat from reaching the infrared instruments that will be located underneath it. The highly-reflective aluminum surfaces also bounce the remaining energy out of the gaps at the sunshield layer’s edges. The kite-like shape and the number of layers of sunshield both play an important role on the Webb telescope. Each of the different layers are positioned and separated with precision to accomplish their function. “The five layers are needed to block and re-direct enough heat to get the telescope down to required temperatures, with margin,” Cooper said. “The fifth layer is mostly for margin against imperfections, micro-meteoroids holes, etc.” The gap between the layers provides an additional insulating effect. Each layer of the sunshield is incredibly thin. Layer 1 will face the sun and is only 0.05 millimeters (0.002 inches) thick, while the other four layers are 0.025 mm (0.001 inches). The thickness of the aluminum and silicon coatings are even smaller. The silicon coating is ~50 nanometers (nm) (1.9 microinches) thick, while the aluminum coating is ~100 nm (3.93 microinches) thick. The layers are slightly different sizes and different shapes. Layer 5 (just under the primary mirror) is smallest and Layer 1 is largest. Layer 1 is relatively flat and layer 5 is more curved. The layers are closer together at center and further apart at the edges to direct heat from center to the outside of the layers. The Webb telescope optics (like the infrared camera and mirrors) must always be protected from direct exposure to any hot objects. So the membranes are sized and positioned such that the mirrors only have a direct line of sight to the cold layer 5, while the sun only directly shines on layer 1 no matter which way the observatory is pointed. “This has been shown through testing to arrest a tear and keep it from extending outside of a given grid area,” said Cooper. So, if a hole occurs in a layer of the sunshield from a meteoroid, or small meteor, the size of the damage is limited. These are not intended to stop a meteoroid, but rather to contain the area of damage.